A good couch can be one of the more expensive pieces of furniture in a home, but most of the time, we take better care of our clothes than our furnishings. By devoting just a little time and care to your couch, you can significantly increase its life span. Before you do anything, invest in quality fabric protection to protect your piece from spills and ongoing soiling. The most common type of fabric protection is Scotchgard, which is a stain and water repellent that can be used on nearly all fabric types. For a more delicate material like suede, it is best to purchase a stain repellent or waterproofer directly from the retailer or to have the item professionally protected. Saddle soap or similar conditioning products should be used on leather. Don’t forget to reapply as per the manufacturer’s instructions. You might also like to use a slip cover for further protection. A slip cover can be removed and cleaned more easily, but if you’ve got a statement piece you might not want to cover it up. Regular cleaning removes dust and dirt that can become embedded into the fibres, causing permanent soiling. 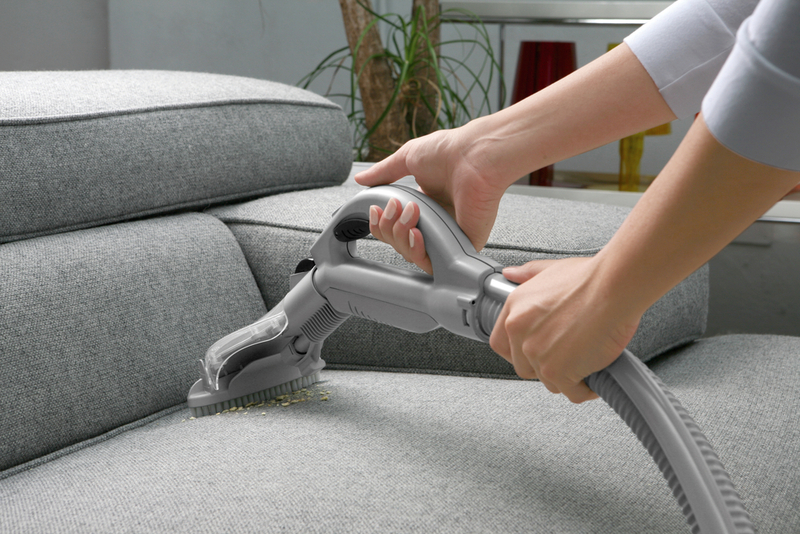 Try to make a habit of vacuuming and cleaning your couch on a regular basis. Use good quality cleaning products for the best results but always check the manufacturer’s instructions and spot test an area that can be easily hidden to ensure that the cleaner will not damage the fabric. When spills occur, clean them up as quickly as possible. Use a damp cloth to blot the spill, rather than rubbing the liquid into the couch. While your best efforts at home can minimise damage, a regular professional clean will keep your couch looking its best year after year. Professional cleaning can remove all the built-up oils and contaminants that household cleaners can’t get. As well as the aesthetic benefits, a professional clean also removes allergens like dust mites and pet dander that can irritate respiratory conditions. Customers often spend thousands on a new couch when they can make small repairs to their old couch for a fraction of the cost. These repairs can increase the comfort, look and style of your couch, and also stop the damage from getting any worse. This is especially true for leather furniture repairs. One of the first parts of a couch that is worn out is the outer cover. Re-upholstering a piece that has no structural problems can add years to the life of the product. A good company can reconstruct and redesigned the piece, giving it a whole new look. Ultraviolet rays can sap the colour right out of your couch. Take note of where the sunlight falls throughout the day and try to place your couch in an area where it won’t be exposed. If you are unable to find such a spot, invest in heavy blinds or curtains that will block out the light and keep them closed during the brightest part of the day. You could also purchase a furniture cover, a cheap fix that can be found at most hardware stores. Heaters can also cause fading and should be placed as far away from the couch as possible. For more information on fabric and leather furniture repairs, contact Lounge Repair Guys Brisbane.